Bosch Tools recently held a press event at their U.S. head quarters in Mount Prospect, Illinois to showcase and announce some new tools. While I was not able to attend this event myself, I was able to send a Tool-Rank representative or as I call him, Dad, to get the scoop on all the latest and greatest Bosch has to offer. He will be here later to share his experiences with the tools, but for now here is the official press release for the new Bosch Axial-Glide 12” Miter Saw as well as a ton of photos. Check them out after the Read More. 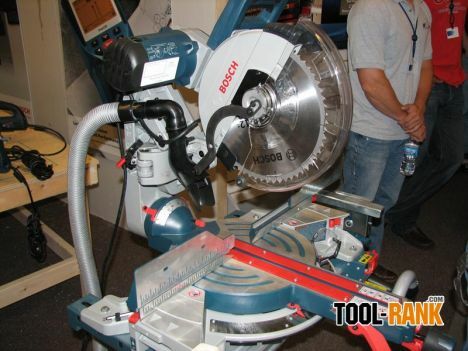 Mount Prospect, Ill., June 2, 2010 – The first thing users will notice about Bosch’s latest 12” dual-bevel miter saw is that it looks nothing like any miter saw they’ve ever seen. The moment they power up the saw on a project, they’ll notice that it feels like no other miter saw they’ve ever used. The innovation responsible for both the unique appearance and the unparalleled level of performance is Bosch’s patented Axial-Glide™ system. Making its debut on the ground-breaking GCM12SD 12” Dual-Bevel Glide Miter Saw from Bosch Power Tools & Accessories, the new system will revolutionize what users expect from a miter saw. Beyond giving the GCM12SD its distinctive profile, Bosch’s Axial-Glide system eliminates three key challenges miter saw users have endured since the first slide systems debuted many years ago. While the traditional sliding compound miter saw approach enables users to make wider cross cuts, that system takes up more space and is prone to misalignment and stickiness over time. By replacing the sliding rail system with a hinged or articulating glide arm system – similar to the linkage used in a four-bar suspension design – Bosch created a more compact miter saw that delivers durable precision, remaining true and smooth over time. The Axial-Glide system operates by folding the articulated arm flush with the back of the saw, saving up to 12” of workspace versus a traditional sliding compound miter saw and enabling the saw to be operated with almost no clearance behind it; ideal for jobsites and cramped workshops. By removing the rail assembly and replacing it with robust cast-aluminum arms, Bosch has built a saw that remains aligned and calibrated even in harsh conditions. With 12 sealed precision ball bearings in place of the sliding-rail interface, the saw provides infinite smooth travel and better control at all miter and bevel angles for the life of the tool. As an added measure of control, a glide damper enables users to increase or decrease the glide action to meet their exact needs. The new Axial-Glide system also offers expanded cutting capacity. The GCM12SD Glide Miter Saw provides 14” of horizontal cutting capacity, a 6-1/2” max vertical cutting capacity against the fence (for base) and a 6-1/2” cutting capacity when cutting crown molding (45? spring) against the fence. As with other Bosch miter saws, Upfront Controls eliminate the need to reach behind the saw to make adjustments. The all-metal bevel lock lever and range selector are conveniently located at the front of the saw for quick and easy bevel settings. Another popular feature retained from other Bosch saws, combined with an innovative new approach to fence alignment, is the Squarelock™ Quick-Release Fence system. Factory machining automatically aligns the two-piece high-precision Squarelock fence at 90? to the table with no additional adjustment. Cast-in scales and the ability to attach sacrificial fences or jigs also enhance the feature. Unique to Bosch, two sliding material supports are integrated into the stable, tip-resistant base, and, with a total extended length of 40”, the GCM12SD offers 60 percent more left-to-right material support than the leading competitor. A dual purpose dust port also adapts to standard 1-1/4” and 33 mm vacuum hoses without a separate adaptor while offering up to 90% dust efficiency cutting 2x material with a vacuum. When it comes to dialing in the saw for precise cuts, Bosch’s GCM12SD makes it easy. The easy-to-read, precision-engineered etched stainless steel miter scale aligns with 10 adjustable miter detents for maximum flexibility over the saw’s entire 52°-left and 60°-right miter range. A miter detent override on the front of the saw can be activated for even more precise adjustments at fractional measurements. High-visibility scales enable users to easily adjust bevel angles 0-47° left or right, and two 33.9° bevel stops are built in. An ergonomic ambidextrous soft-grip trigger handle offers comfort and control, while the clear lower guard delivers unobstructed visibility throughout the cut. Along with its innovative design and superior adjustability and precision, Bosch equipped the saw with its proven 15 Amp motor. Providing 3,800 rpm and 3 HP (max), the GCM12SD powers through cuts with authority, time after time.